The 2.4-ton spacecraft, Germany's Roentgen Satellite (ROSAT), is expected to fall Oct. 22 or 23. The satellite will break up into fragments, some of which will disintegrate due to intense re-entry heat. But studies predict that about 1.6 tons of satellite leftovers could reach the Earth’s surface. That's nearly half ROSAT's entire mass. All areas under the orbit of ROSAT, which extends to 53 degrees northern and southern latitude, could be in the strike zone of the satellite's re-entry. The satellite will be the second large spacecraft to make a pre-announced fall from space in as many months. On Sept. 24, NASA's 20-year-old Upper Atmosphere Research Satellite (UARS) crashed into the Pacific Ocean in a widely publicized death plunge. The ROSAT project was a collaborative venture among Germany, the United States, and the United Kingdom. It was developed, built and launched on behalf of and under the leadership of the Deutsches Zentrum für Luft- und Raumfahrt (DLR), Germany's space agency. The ROSAT satellite undergoing tests in the space simulation chamber at Dornier. ROSAT was placed into Earth orbit on June 1, 1990. 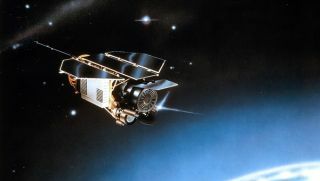 The highly successful astronomy mission ended after nearly nine years, with commands sent on Feb. 12, 1999, to shut the spacecraft down. The spacecraft does not have its own propulsion system, so it could not be maneuvered into a controlled re-entry at the end of its mission. Moreover, the satellite is zipping through space in deaf and silent mode. That is, ROSAT is no longer able to communicate with DLR’s control center in Oberpfaffenhofen, nor is it possible to establish contact with the spacecraft. Even in its death throes, ROSAT is expected to be a useful servant, albeit in a way unintended at launch. According to Heiner Klinkrad, head of the European Space Operations Center's Space Debris Office in Darmstadt, Germany, the ROSAT tumble from space will be useful in sharpening re-entry prediction tools. "ROSAT will be an official re-entry test campaign," Klinkrad told SPACE.com. Klinkrad serves as secretary of the Inter-Agency Space Debris Coordination Committee, an international governmental forum for the worldwide coordination of activities related to the issues of human-made and natural debris in space. The IADC has performed re-entry prediction test campaigns since 1998. Data-sharing has led to more-accurate re-entry predictions. Targets used for IADC re-entry initiatives have included the UARS spacecraft, several Russian Cosmos satellites, various upper stages, and even the fall of a huge ammonia coolant tank that was purposely tossed off the International Space Station by spacewalking astronauts in July 2007. The ammonia tank burned up over the South Pacific in November 2008. ROSAT's nose-dive may result in as many as 30 individual pieces striking the surface of the Earth. About 1.6 tons of the satellite could survive re-entry, according to DLR description. The heaviest component to reach Earth could be the satellite’s X-ray optical system — with its mirrors and a mechanical support structure made of carbon-fiber reinforced composite — or at least a part of it, DLR officials said. Fragments striking the surface of Earth could be traveling at speeds of up to roughly 280 mph (450 kph). As ROSAT's demise approaches, German scientists will be evaluating data provided by the U.S. Space Surveillance Network. In addition, the Tracking and Imaging Radar, the large radar facility at the Fraunhofer Institute for High-Frequency Physics and Radar Techniques in Wachtberg near Bonn, will be monitoring the descent to further improve calculations of its trajectory. Experts will be analyzing data to predict the moment of re-entry. All of this information will be collected and evaluated in the European Satellite Operations Center in Darmstadt, then forwarded to the DLR.